Due to California’s proximity to the coast, the ocean generates temperature extremes in majority of the region. This results in very hot, dry summers and extremely wet winters. In fact, summers in inland California can see temperatures well over 100 °F during the day, making them prone to wildfires. Oakland, CA, homeowners know that their roof is constantly vulnerable to harsh elements, including intense heat, high winds, rain storms, and torrential precipitations. Without regular maintenance, local roofing systems can deteriorate easily, prompting you to spend more money on repairs and/or replacements. A sturdy roofing system is a must for local structures, which is why it’s important to partner with a reliable contractor to help take care of your roof. For all of your roofing needs, you can turn to Green Air Heating and Air Conditioning. Why Entrust Your Roofing Needs to Green Air? 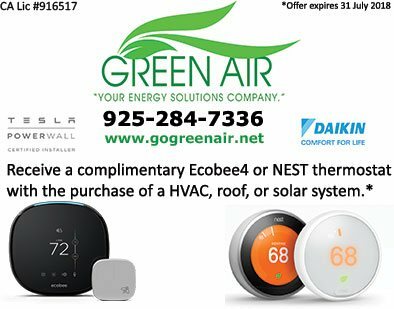 The number one reason you should trust Green Air Heating and Air Conditioning is because we are a Certainteed® Master Elite™ roofing contractor. This designation is only given to 3% of roofers in the country who have passed the strict standards of Certainteed. With the Master Elite title, we have the capability to offer local homeowners Certainteed’s full product line, along with their Golden Pledge® warranty, which is considered as one of the strongest industrial warranties today. We also undergo Certainteed’s regular series of training to keep up-to-date with the latest techniques and innovations on roof installation and repairs. Aside from being a Master Elite roofer, we are also a Certainteed Certified Green Roofer. This strengthens our commitment to sustainability in all aspects of our work, from our installation practices to the products and services we provide. Our local specialists are familiar with California’s weather and temperatures throughout the year, and understand that no one should be left uncomfortable in their home. With us, you can enjoy a cozy interior atmosphere all year long. For more information about our services, you can call us at (925) 62-SOLAR or (925) 28-GREEN. You can also complete our contact form to request a FREE quote. We’ll be glad to assist you every step of the way!